Fanciful floral patterns with a sophisticated touch for spring wedding stationery. The essence of spring is captured in the vivid depictions of flora and fauna that enliven this custom stationery suite by East Six. Exquisite graphics enhance all sides of a side-fold guest guide as well as an oversize mailer envelope, while the hand-calligraphed invitation on luxurious stock gleams with gold foil. Letterpressed inserts combine tailored fonts with elegant script for a finishing touch of sophistication. 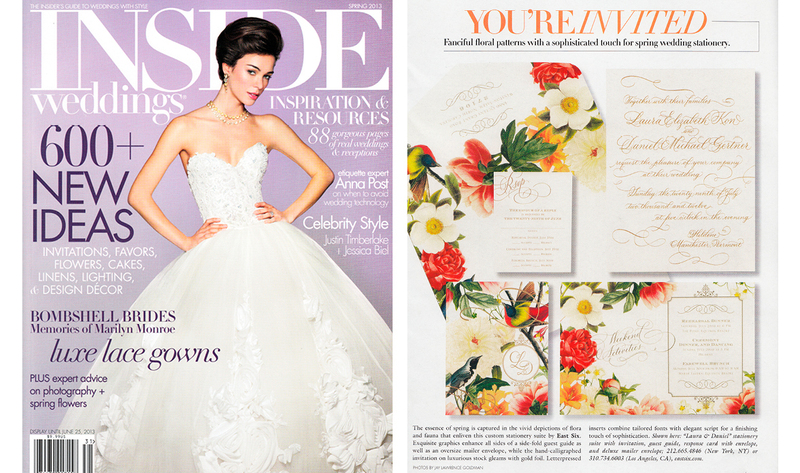 Featuring Laura & Daniel‘s beautiful floral invitation suite!